Over many years, we have witnessed incredible feuds, lyrical quarrels, a few fistfights, and unfortunately, a few deaths, over what has been said on the mic. In whatever fashion we would like to use in order to describe Hip Hop, whether as a culture, a movement, a political/social force, we must consider that it is all of the above, and that it is still a career in where people use to feed their families. In fact, Hip Hop even has it’s own unique offering of work-related injuries. Whether that injury is: a busted jaw, a bruised ego, a ruined career, or a funeral (God-forbid), there are repercussions for what emcees deliver over the microphone. Nonetheless, there seems to be a place for “beef” in Hip Hop. Unlike today’s artists, where just about everyone sounds identical, and where friendship is overly-abundant, there seems to be a missing link for emcees who need to sharpen their pens. That missing link seems to be Beef. Without direct competition (Beef), how can an emcee ever expect to get [dare I say] better on the mic?. If an emcee goes on to believe that he never has to sharpen the pen, and that he’s just that dope, then, what’s the point of it all? If you’re a fan of Bruce Lee you probably remember him saying, in Enter The Dragon, “boards… don’t hit back”, – one impactful line that we should all adhere to. In order to understand, and for emcees to apply this message, we have to accept the fact that ‘steel sharpens steel’. A good Beef is healthy for Hip Hop; overall, it propels the culture. Similar to a good argument, it allows for an emcee to cleanse their notebook of all the nasty things that were [probably] written about their contemporaries anyway. In addition to this, Beefs usually result in a flood period of outstanding music; the sort of music that’s timeless, and the type of music that makes people in your local barber shop on Saturdays go stir-crazy. More than that, a good Beef makes emcees test their skill under pressure. At any point an emcee can make a good song – given that there’s no immediate pressure, and as long as expectations are held at bay by mediocrity – the standard of the modern era. The benefits of Hip Hop Beefs are insurmountable. Along with the overflow of music that’s produced with Beefs, which is a huge win for the listeners and fans, emcees who aren’t at all involved with the Beef benefit by learning [Not copying]. An instance of this can be pointed out in one of Hip Hop’s most recent Beefs – Drake Vs Meek Mill. During the height of their short-lived, and almost unbearable Beef [it was sort of wack], we witnessed the lasting effects of the Nas Vs Jay-Z battle. In the same way that Drake used fan-inspired memes to help launch his attack on Meek Mill during a concert performance, Jay-Z used an unflattering picture of Mobb Deep’s Prodigy while performing “Takeover” for the first time during Summer Jam. Despite it’s destructive labeling, and the hazardous disposition assigned to it, in many ways Beef helps emcees who are directly involved – even when one emcee is obviously losing. 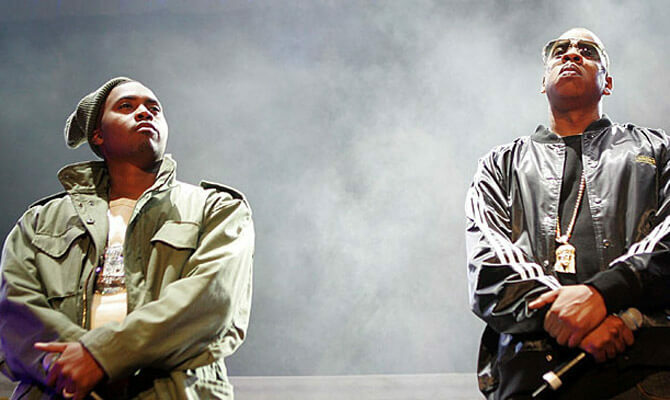 Consider Nas Vs Jay-Z – arguably one of the most lethal diss-tracks EVER recorded, “Ether” all but destroyed Jay-Z, while allowing Nas to re-direct the Hip Hop world’s attention back to Queensbridge. Reflecting briefly on this momentous battle, it seems appropriate to suggest “Ether” was unlike anything that had ever been heard before in Hip Hop; and as a direct result, just about everyone in Hip Hop was able to benefit from the record. Nas, of course, benefitted [immensely] by having his once desolate career rejuvenated. Conversely, Jay-Z benefitted by spawning another classic album, and cementing his place among Hip Hop greats – He survived one of the worst diss tracks ever. Meanwhile, [Hip Hop] artists at large now had a new barometer for a great diss record- it became “The Blueprint” for battling (word to Jigga). In short, Beef is a part of the culture. Whether we’re talking a face-off between Loaded Lux and Murda Mook, or, Common Vs Ice Cube, Beef has been a mainstay in the imperial era of Hip Hop. Within its complicated, strange, and sometimes [very] weird state of being, Hip Hop has always welcomed competition. This part of the culture, although over-dramatized and even bastardized at times, is, and should forever be, a part of what makes this art so special. If you find yourself wanting more, hit me direct on Twitter @JordanSallis.